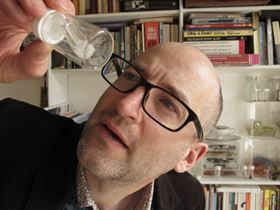 UCL’s Professor Mark Miodownik is a materials engineer, broadcaster and writer, and recipient of this year’s Michael Faraday Medal from The Royal Society. Laurie Winkless spoke to Prof Miodownik about his career, the multidisciplinary Institute of Making, and his lifelong love of materials. Your role at UCL is Professor of Materials & Society. How did you go from being a ‘science kid’ to someone who combines fundamental materials science with design, art, and architecture? Ooh, that's a good question. Well, I guess I always loved doing experiments, being in the lab, dealing with data – basically trying to understand how materials work. I did a PhD in materials science - in jet engine alloys - at Oxford University, but I was puzzled that people in materials research only seemed to study the technological applications of materials. I had loads of friends who were artists and designers, and they had really interesting material problems that never seemed be addressed by traditional materials science. I’d also picked up these books by Cyril Stanley Smith who was a Professor at MIT in both Humanities and Metallurgy. That gave me confidence that these fields could be brought together. But I didn’t know how to do it. Then I was offered a job in America, which took me in a different direction. I started to work on the self-organization of metal microstructures and how much these had in common with self-organisation mechanisms in biological materials. I then spent a year working in Dublin, before I was offered a lectureship at King’s College London. What doors did that job at King’s open for you? I was amazed to be offered it to be honest – I put in an application with the sole hope of getting some interview practice! But it was a heavenly moment. As a young academic, you spend all this time battling, looking for postdocs, moving house, etc. – the insecurity of it all really gets to you. So when I got the job, I remember feeling the waves of tension that had built up over years, being released from me. I could now do the thing I’d always wanted to, which was to build a lab that combined both the art and science of materials. I also feel fortunate that I got to do this in London – the cultural scene is world-famous, and people are receptive to sharing ideas. But it wasn’t easy to actually implement. I had to figure out how to define the research questions in this area. I met with lots of artists, designers and architects, but realised pretty quickly that although we were receptive to each other, we didn’t really have a common language. I’d talk about theory, where they focused on sensory and aesthetic properties. The only time we could really communicate was when we had physical samples of materials in front of us. It struck me that a collection of materials would be the prefect way to enable conversations, and start identifying research questions that were interesting to both artists and scientists. Is this where the idea for building a Materials Library came from? It was the first step on the road. The next breakthrough came from NESTA, an organisation that had been set up by the government to sit across humanities and science. They identified me as someone they might like to fund, if I could come up with a suitable idea. So I proposed the concept of a Materials Library that would act a multidisciplinary research tool, and they funded it. It was amazing really, I had five years of funding, with no strings attached, to develop the idea and carry out research projects. That freedom was a remarkable gift – they didn’t want papers and I didn't have to hit milestones. So I could try new things, without fearing that my entire career was at stake if they failed. I took on a PhD student (Zoe Laughlin who is now the Co-Director of the Institute of Making) who would work at the interface of the science, art, craft and design of materials. One project we worked on involved building a set of spoons from different materials to explore the chemical basis of taste. That led to us collaborating with a Michelin star chef, and we ended up publishing a couple of research papers around taste sensations in restaurants. At this felt point I felt we were doing really original work, and that we’d identified a unique research opportunity. But we needed a lab that everyone would be happy to work in, regardless of discipline – an Institute of Making. This set a real challenge for King’s. With our research sitting across several disciplines, it was tricky to understand how to assess it, I didn’t compare well to academics doing pure materials science! But, I caught another lucky break – I was encouraged to apply for a position at UCL by the Dean of Engineering who really valued the interdisciplinary nature of our work. And four and a half years ago, we finally opened the Institute of Making, with our Materials Library at the heart of it. By creating multidisciplinary lab that allows artists, architects, and anthropologists to work on equal terms with scientists and engineers, a different type of research gets done. The Institute is described as “… a multidisciplinary research club for those interested in the made world”. How do you feel about it and its role within the wider materials engineering landscape? It sounds silly, but it still makes me extremely happy just walking into the space – it still seems miraculous that it happened, just like all births I suppose. I have an incredible team of people to work with, but we don’t own it. Thousands of staff and students from the whole of UCL use the Institute of Making, from Anthropology to Architecture, from Materials Science to Medicine. I’m proud to have been part of changing attitudes within materials science to the arts and humanities. We have shown that by creating multidisciplinary lab that allows artists, architects, and anthropologists to work on equal terms with scientists and engineers, a different type of research gets done. I also think that it helps to change attitudes about what materials engineering actually is. We too often present it as bring about optimizing technology, rather than looking at how materials allow humans to meet their needs and achieve their dreams. I try to take that approach with my students – instead of asking them to optimise a gear, I’ll ask them to design an eating utensil for someone who's got dysphagia (difficulty in swallowing). I want them to see the whole subject, and that goes beyond just measuring the mechanical properties of a material. You’re involved in a project called Self-Repairing Cities. Can you tell us more about what you’re working on? The project is led by the University of Leeds, and it involves civil engineers, mechanical engineers, materials scientists and economists. We’re thinking about the future of infrastructure, particularly roads, and how we can use technology to help it look after itself a bit more. For crack mitigation, we’re getting the hang of 3D printing asphalt, and we can now attach it to a drone. Fingers crossed, we will be demonstrate a drone repairing a road later this year. Alongside your research, you do a lot of engagement activities, through books, talks, radio, and TV. Do you feel a responsibility to represent materials science in the public sphere? My role is Professor of Materials & Society, so that means I combine outreach and engagement with teaching and research. The public stuff is a lot of fun, but yes, I do feel a sense of responsibility. Other disciplines tend to dominate the media – there’s lots of physics, biology, literature, music etc. on TV. Materials research is as creative, as culturally important as any of those and that’s what drives me to make TV programmes and write books. I’m very glad that there are now lots of excellent people flying the flag for materials in the public realm, it is a very diverse subject and needs to be represented by a diverse range of people.